Need to search a large amount of files/folders for specific text and/or replace that text? Enter Text Workbench. With Text Workbench, you can use regular expressions to search for text in a variety of different files and replace it. You can set it to either include or ignore whitespace. Text Workbench 6.2 is a shareware program and can be used as a demo to try the software until the free trial period has ended. A full version of the program is available after the trial period ends. For security reasons, you should also check out the Text Workbench download at LO4D.com which includes virus and malware tests. Additional screenshots of this application download may be available, too. 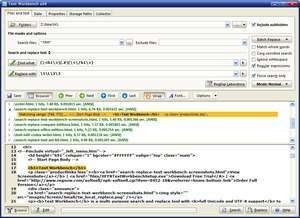 With support for many different types of files, these applications generally search through the text of one or multiple files and replace the occurrence of a block of text, sometimes utilizing regex or wildcards. Check out some of the freeware downloads available in the search and replace program category. They contain no strings and are available at zero cost.